Last week Jimmy Kimmel's late night show was invaded by Gary, one of his Jewish writers, dressed as the Chanucorn, a unicorn with a menorah horn. Gary is always trying to get Chanukah related bits on the show, so last year he created the 'Chanucorn.' Just in time for the holiday, Gary's favorite creation tries to turn Jimmy's show into a prime time Chanukah special. Get ready for some shmoozing, kibitzing, and even a little mishegas as Gary and Jimmy engage in banter using just about every popular Jewish expression you can think of. 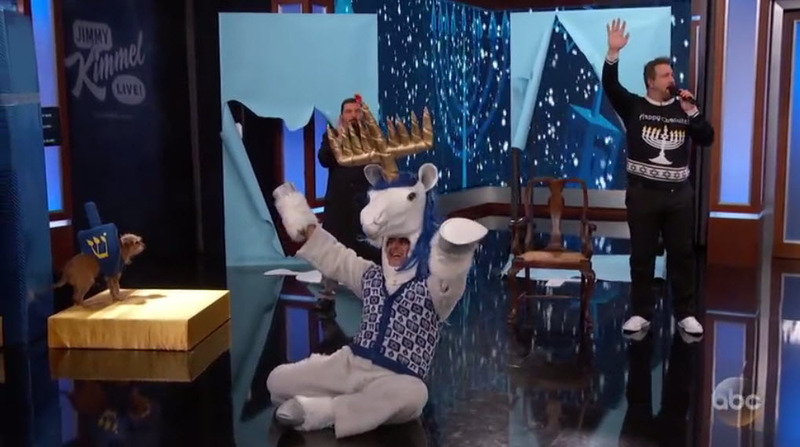 The sketch includes singer Joey Fatone and (seeing is believing) the one and only Dreidel Dog. Oy Vey! Laughed my kiskas out!